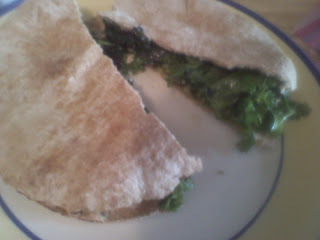 To begin: I visited my local health food/grocery store and bought Ezekial sprouted grain pitas. They were frozen at the store, and still a little cold by the time I got home so I put them in the oven for a few minutes. any additional herbs or seasoning of your choice...get creative! I took the pita bread and smoothed 1/4 avocado on the inside, inside each pita, using a total of 1/2 avocado. I used the avocado as a replacement for mayonnaise. 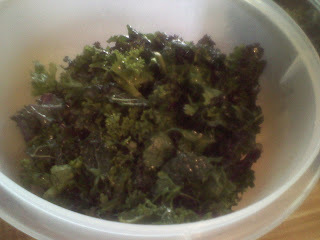 Next I mixed together the kale, cilantro, salt, olive oil and lemon in a big bowl, breaking down the crunchiness of the kale until it was a bit softer. I took that and used it to stuff the pitas. It is a little creamy and tangy with a nice zing as you bite into it :) Perfect! My parents were a little hesitant at first, but ended up liking it.